Shrewsbury Cakes Mrs Beckett 1/2 lb of flower - Do of sugar, Do butter, mix it up with a spoonful of wine and one egg let it stand 3 hours. A Dutch [Surlier?] Take a lb of flour 3/4 of a lb of currants 1 Tablespoonful of good yeast, 4 eggs well beat, 4 oz of butter melted in a tea cupful of cream, 1 oz of almonds cut fine, cinammon, nutmeg, lemon peal & sugar to your taste bake it in a mold it requires a quick oven, 2 hours will bake it when hot it is a good pudding, when cold a good cake. Ginger Cakes - Mrs Morley Take an ounce of grated ginger, put it into a pd of flower well dryd take half a pound of Butter butter and one pd of moist sugar, rub them well together wet it with cold water to a stiff paste roll them out thin & make them what shape you please. bake them on tins in a slow oven To a Wash or Renew Black Calico Take 1 lb of logwood, 1 qr lb of copperas, 1 pennyworth of [shoe?] 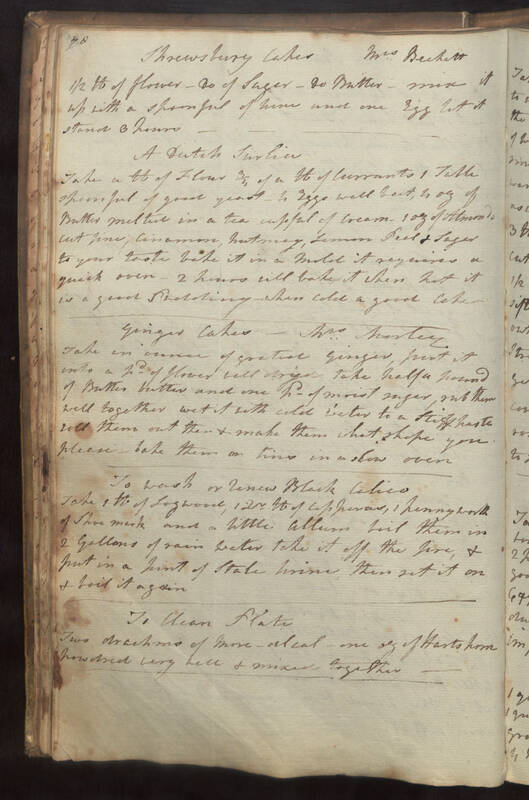 mark and a little allum boil them in two gallons of rain water take it off the fire, & put in a pint of stale wine, then set it on & boil it again To Clean Plate Two drachams of m[illegible], one oz of Hartshorn powdred very well & mixed together.